There was a time when I used to ride almost every single night. My friend Glenn owns a local bike shop and doesn’t get out of work until dark, even in the summer. To squeeze in a some miles he goes out nightly for rides that are sometimes sprint-athons and sometimes epic climbs. He’s got this way of figuring out what kind of route I’m not currently in shape to handle and then leading that type of ride. It’s great for training. For safety, Glenn goes the route of trying to look like a rolling carnival, while I opt for more surgical precision https://www.bikehugger.com/post/view/revolights-hugga-after-dark. Both of us though like to have as much light on the road as possible, especially front-facing lights. We’ve taken the same approach to lighting up the road ahead of us though with a bright light on our handlebars for wide-area coverage and a more focused light on our heads. The head-based lamp allows us to either provide more light to the road or point it at an oncoming car that might not otherwise notice us. 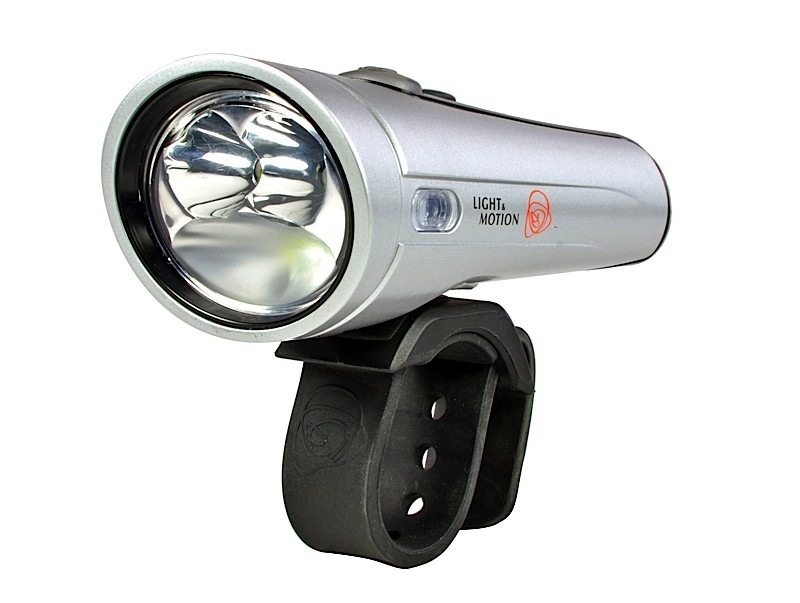 A few years ago I bought the Light and Motion Taz 1200 Lumens Light and have used it on countless rides in everything from a warm summer breeze to a torrential downpour. Light and Motion recently sent us the smaller (and slightly less expensive) Light and Motion Taz 1000 Light , an almost identical light that throws 200 fewer lumens of light for about $50 less. In the Heart of Darkness I’ve found the Taz 1200 is actually too bright for normal use. I know it’s odd to think of a light being too bright but it provides a level of light that’s designed to illuminate objects that just aren’t a hazard. I’d use this light without any hesitation on a mountain bike ride. I often run the Taz 1200 at the medium brightness on this trail. The Taz 1000 throws a similar beam of light, although it’s not quite as bright as the Taz 1200, naturally. Just like the bigger light, the Taz 1000 works find at a medium setting for most dark riding and can even be run at the lowest level for urban riding. There are times when I want the light to run at full-force, such as when I’m on a downhill or in traffic. In these cases it’s reassuring to have the extra light of the Taz 1200 but the 1000 lumens of the test unit really was enough for almost every condition. On the road the Taz 1000 is a fantastic light. The rubber strap allows it to connect easily to any sized handlebars and it doesn’t shake or vibrate as I ride. I like to point the Taz ahead of the wheel by a few meters as the beam pattern casts enough for light to shine right in front of my wheel and I’ve got a secondary light to check for potholes. To test the Taz 1000 though I ditched the headlight and wasn’t at all disappointed. I aimed the Taz 1000 a bit closer to the bike than I would with two lights. There were no instances in which I thought I didn’t have enough light. The Taz 1000 has side-mounted amber lights that are designed to provide perpendicular brightness, though I’m not really sure they’re all that helpful as it’s pretty easy to miss a small amber light in the darkness. Still, many lights miss any side illumination so it’s definitely better to possibly have someone see your lights from the side then to have definite darkness. My buddy Glenn usually uses a handlebar light with an external battery pack and he’s got longer run time than my Taz 1200 or Taz 1000. He’s also got the option of putting the pack inside of his jersey or an insulated pouch if it’s cold, something that significantly helps the run time of the light. On several occasions with the Taz 1200 (and also the Taz 1000) I’d see the light’s status light turn from green to orange after the first twenty minutes. This is a bit disconcerting but I’ve rarely on a ride had the light go to red, and I’ve never had it go out on me. It would be great to have a more visual fuel indicator, like status bars. If I were doing a long distance ride I might consider putting two of these on my handlebars and switching when one goes out. The Taz 1200 is only $50 more and boasts almost exactly the same run time. I’m guessing the Taz 1000 has a slightly smaller battery which is why the run time comes out as a wash.
For the urban rider (or those that are riding only at dusk or sunrise) the Taz 1000 is the right choice—there’s no need to spend extra money on the 200 extra lumens if there are streetlights and other light sources to cast ambient light. If however your’e in a more suburban or rural setting, spend the extra money and get the Taz 1200. There’s more light available at a similar price. In either case, Light and Motion have created an incredible light source with a great price and a nearly perfect package. It astounds me that it’s possible to get a light of this power in a size that’s the size of a Type 1 Phaser (for you nerds out there.) But it’s possible, and it’s here in the form of the Taz 1000.